Okja, Bong Joon-ho’s new Netflix movie, reviewed. Bong Joon-ho’s irresistible first movie for Netflix is an anti-capitalist E.T. starring Tilda Swinton and a superpig. The three syllables Bong Joon-ho (known in his native South Korea as Joon-ho Bong) evoke a particular kind of thrill in a particular kind of film fan. Of the great directors currently working, he may be the most playful, the most unpredictable, and the most stylistically omnivorous. His movies resemble each other only in their originality. His filmography so far includes (but is not limited to) a kaiju-style monster movie that’s also an environmentalist comedy (The Host), a psychological murder mystery built around an intense mother-son relationship (Mother), a based-on-a-graphic-novel political allegory set in a dystopic sci-fi future (Snowpiercer), and now, Okja, an animal rights–themed thriller that’s also a comic fable about corporate greed and, perhaps most importantly, a love story between a girl and her really big pig. Well, pig is a tad misleading. The genetically modified, lab-bred Okja is a creature about the size of a hippopotamus. She’s more hippolike than porcine in other ways, too: Her skin is gray and leathery rather than pink and smooth, and her perpetually snuffling snout lacks that familiar flat oval shape. As rendered in a mixture of puppetry and digital animation, she’s refreshingly uncute by saucer-eyed Disney standards. But Okja’s long ears do flop like a cocker spaniel’s, and the devotion she displays to her beloved 14-year-old mistress Mija (Ahn Seo-hyun) is similarly canine. Since being created by the shady agrochemical company Mirando, Okja has spent the first 10 years of her life living in rural bliss with Mija and her grandfather on a remote South Korean farm. 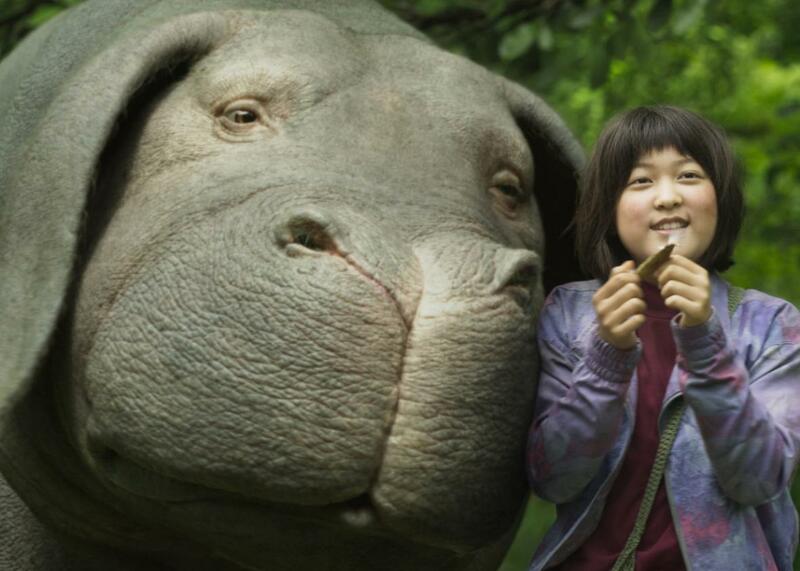 But despite their deep bond, Okja and Mija are fated—and contractually bound—to be separated: The girl and her grandfather are only Okja’s foster family, hired by Mirando to raise the valuable animal in photogenic, wholesome surroundings until she and her GMO siblings could be launched on the world food market. Now that the much-hyped superpigs are fully grown, it’s time to introduce them first to the public and then to the slaughterhouse. When Mija learns that her lifelong pet is in danger, she sets out to rescue Okja, a quest that will take her to Seoul and later to New York, where an elaborate “pig beauty contest” and product launch is being planned by the brittle, jargon-spouting CEO Lucy Mirando (Tilda Swinton, who also plays Lucy’s controlling twin sister). One of Okja’s great charms lies in its director’s ability to vary tone, pacing, and style between scenes without losing the viewer’s patience and sympathy. Mija and her grandfather’s domestic life is introduced in a series of gently comic scenes that take up nearly the entire first half-hour. Yet when the gears shift abruptly for a wild pig chase through a busy Seoul mall, our attention never wavers; we’re ready to dive right in to what has all of a sudden become an action movie. Soon Okja will veer into other, equally unforeseeable zones, all of which seem to make sense once you get there. Eventually, Mija—who speaks no English and has never been to the big city, but who’s smart, strong, and unbelievably stubborn—crosses paths with the (real-life) animal rights group the Animal Liberation Front, which has devised a plan to infiltrate the experimental labs at Mirando and expose the company’s abusive practices. The ALF’s harm-no-living-thing credo means everything to the group’s leader, Jay (Paul Dano), a true believer whose extreme gentleness hints at a skillfully applied tincture of menace. Jay’s Korean American translator and right-hand man K (Steven Yeun) is caught in a moral dilemma: Should he obey the girl’s wish to be sent back home with her pet, or, as the only one present who understands what she’s saying, should he find a way to enlist the two of them in the liberatory scheme even against Mija’s will, for the greater good of superpigs everywhere? Okja is generous enough to spare even a tertiary character like K a real moral arc, one that ends in a joke I won’t spoil but that could have served as the movie’s epigraph. Bong bounces freely between Mija’s rural home, where an ancient way of life is just beginning to be changed by digital technology, and the selfie stick–bearing, endlessly image-conscious realm of global consumerism. The cinematography by Midnight in Paris wizard Darius Khondji also bounces, from cold corporate whites to rich forest greens to gaudy carnival colors. The latter appear most prominently in the wardrobe of Dr. Johnny Wilcox (Jake Gyllenhaal), a TV huckster who carries out the evil experiments meant to help turn Okja and her kind into the most cost-efficient meat products on Earth. There are likely to be dinner-length post-movie arguments about Jake Gyllenhaal’s character, though hopefully not at tables where you are seated. There are broad performances, there are performances said to be “as broad as a barn,” and then there’s Gyllenhaal’s performance in Okja, which seems to be taking place in a separate viewing modality from the other actors’, as if projected on the side of an extraordinarily large barn possibly belonging to Jerry Lewis. Like the bottom-feeding tabloid news photographer Gyllenhaal lost 30 pounds to play in Nightcrawler, his squeaky, grating character here feels false to me; it’s a performance so mannered and manic it doesn’t communicate anything outside itself. I’ve already heard critics protest that this outsize quality is precisely what indicates Gyllenhaal’s growth as a performer and that bold, sometimes crude brushstrokes—including, when necessary, slapstick falls and jokes about pig poop—are a part of Bong Joon-ho’s inimitable charm. I will concede the second point, but there are plenty of cast members in Okja who give big, stylized performances—Swinton as the scheming Mirando twins, Giancarlo Esposito as their unreadable consigliere, Dano as a comically soft-spoken revolutionary—and none of those actors made me squirm instinctively toward the nearest exit the moment they appeared onscreen. Whether the extreme physicality of Gyllenhaal’s approach was his own choice or the preference of his director, it’s a distraction and a drain on the audience’s energy, one of the few weak links in an otherwise near-irresistible movie. Though this film is about a girl in her early teens going to heroic lengths to save her pet, and though it weaves in moments of hope, love, and idealism along with sardonic social commentary, Okja isn’t a film for young children. There’s a fairy-tale quality to its elemental child-rescues-pet story, true, but there are also graphic scenes in labs and on slaughterhouse floors, and a great deal of the humor—some of it topical, nearly all of it pitch-dark—will go over little kids’ heads. Okja is far from a brief on behalf of vegetarianism—Mija’s favorite food, it’s noted in one early scene, is chicken stew—but it leaves you with a vision of the capitalist food chain that’s less than morally appetizing. As Bong’s ample perspective makes clear, that food chain isn’t just literal but metaphorical. Whether or not Mija and the ALF succeed in their mission to bug the Mirando labs and rescue Okja, the problems they’re struggling to address—income inequality, environmental pillage, and corporate malfeasance—will outlast their individual story. If you see Okja, and I hope you do, stay for the final credits. It’s not often that a stinger scene pops up at the end of a movie, not to pre-sell the inevitable sequel, but to leave you with something to think, wonder, and worry about.